With everyone worried about gas prices and thieves drilling into gas tanks, we started thinking about the most fuel-efficient used cars on the market (after we determined that building a Nukchero meant risking ball cancer). After all, who wants to spend their hard-earned dollars on a new car when a quality used one can be yours with little to no effort and very little cash from your pocket. 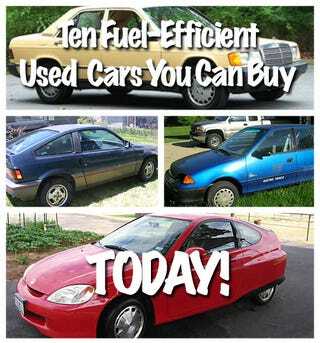 Because mileage estimates differ, we used FuelEconomy.org for cars built after 1985 and MPGomatic for older cars. And to prove this isn't just a philosophical discussion, we've actually gone ahead and done the hard work, finding examples of each of these cars for sale. Right now. Check them out below, then go ahead and make a bid! If your favorite is already sold, help your fellow car-loving brethren out by searching for another and providing the results in the comments below. Who says you can't ride in a luxury sedan and still look out for the environment? Though we loved our Mercedes 300D, we have to say that the 1985 Mercedes Benz 190 is a classy way to roll. With 26/35 mpg and a combined 30 mpg, others will be green with envy at your green ride — but only in the diesel version. If you find an "E" you've gone one letter too far. Last we checked — we found a mustard cream Mercedes 190D that sold for just over $3,000. What we have here is the extra special Honda CRX HF which gets 42/51 MPG with a combined fuel economy rating of 46 MPG. Not too shabby — and Murilee's even seen a 1986 model-year CRX HF in great condition down on the Alameda Street. It also looks awesome with that two-tone paint. Sure it only has 58 HP, but when you sip fuel like this you can enjoy the ride. Assuming you aren't in the mood for spending money on fuel, you could always go the electric route. Numerous electric cars have been made over the years, and the Solectria Force is one of the better deals. Based on the Geo Metro, the little car has a top speed of 68 mph and a range of about 40 miles, but you can't beat the unlimited mileage. There is a Force for sale at the low, low price of somewhere above $3,500. All of a sudden it's cool to drive a Geo. But it can't be just any Geo; it has to be the Metro XFi, which is considered to be one of the best fuel-sippers on the road today. That alone should make it deserving of mention, but it loses "cool points" because every outlet from the New York Times to NBC has profiled the skyrocketing used prices of the little econoboxes. Check out this 1994 XFi in fairly good condition. Sure it's got 180,000 miles and they upgraded to the "13-inch" rims, but when gas hits $5 a gallon you'll be hotter than a Hummer rolling on 22's thanks to 43/51 mpg with a combined 46 mpg. Many have forgotten that Mazda supplied diesel engines to Ford during the early 1980's, resulting in some rare novelty cars. One of our favorite examples is the Diesel Ranger pickup. Who says that trucks have to be gas guzzlers or that diesel pickups have to be heavy-duty? In 2WD form with the manual transmission, the 83 Diesel ranger will get 33/41 mpg. Despite the higher mileage, this Ranger XLT Diesel looks great and, for less than $4,000, you can buy it now and have your very own oil-burning Ranger. Not every used car that gets great fuel economy is a small beater hatch. One car that acheives great mileage and has lots of usable space is the beautiful and powerful Jetta TDI Station Wagon. With the manual transmission, you can achieve 34/42 mpg with a 35 mpg combined. This TDI wagon has just about every option and is only up to $16,000. That's a little steeper than most, but you get German quality and wagon storage for that price. We had a friend who treated his Ford Festiva with an almost creepy level of care, packing it to the gills with junk for the trip home from college every summer. Though not the most fuel efficient vehicle in history, the sharp little hatch gets 30/37 mpg with 33 mpg combined (though most report closer to 40 mpg combined). And who could pass up this hot Festiva Sport? Check out those rims and bucket seats. Who needs a Porsche? People have claimed some pretty amazing mileage with the Honda Insight, the first mass-marketed hybrid available in the US. Sure, there isn't much room, but some owners report up to 83 mpg on the highway (when going downhill, slowly, behind a truck we'd imagine). Officially, the car achieves a still-outrageous 48/60 mpg with a 53 mpg combined rating. With the 11-gallon gas tank, you're talking about taking trips of nearly 600 miles without filling up. If you're near Paradise, TX, you should considering bidding on this Honda Insight, which looks sharp in red. While we consider the $12,000+ price to be a bit steep, with estimated annual fuel costs of $1,145 how can you say no to that dopey smile? The mid-engined, RWD Toyota MR2 proves that you don't have to be a front-engined FWD car to sip fuel. Though the 23/29 mpg mileage isn't the best on the list, it's probably the sportiest looking vehicle in our lineup. This particular Mr. 2 would do great against the CRX and, with its adjustable shocks, would be a fun weekend racer for the endurance-minded driver. Just $3,200. What would a Jalopnik list be without an El Camino? This time we've got a diesel VW Rabbit pickup with the four-speed manual transmission. In this trim, the hot little truck achieved around 40/54 when new and, assuming good care is taken with it, could continue to put out great numbers. Bidding stands at $2,550, meaning that someone can live the diesel dream and the El Camino dream simultaneously.